On MiWay, PRESTO is the cheapest way to pay your fare. Your PRESTO card works on transit agencies in the Greater Toronto and Hamilton Area (GTHA) and Ottawa. Service Locations include Mississauga Community Centre's, the City Centre Transit Terminal, Islington Subway Station and select Shoppers Drug Mart locations. You can save by setting your card to pay a fare type, such as Youth or Senior. The Child and Youth fare types expire based on birth date. Get added benefits such as balance recovery, overdraft trip, autoload and autorenew features. When you set up autoload or autorenew you always have funds available. Online transactions may take up to 24 hours to show up on your card. Have your card ready before you board the bus. Your two-hour transfer period will be activated from the time of your initial tap-on. Note that MiWay Customer Service does not have access to PRESTO account information. For account inquiries, please contact PRESTO Customer Service. Have more questions about PRESTO? Board faster by not needing to search for exact cash or the right ticket. Pay the lowest fares with PRESTO. Travel seamlessly across transit agencies in the GTHA. Protect your balance in the event your card is lost or stolen. Earn free trips on MiWay for your loyalty. 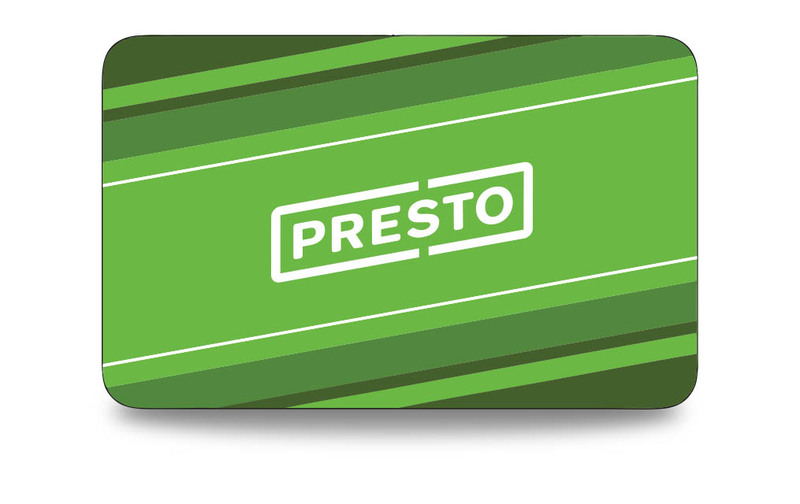 Pay less with PRESTO when you connect between GO Transit and MiWay. Transfer for free within two-hours from when you first tap on the bus.